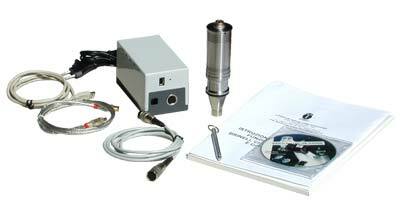 Brinell Check is a small video instrument (it can be hold in a hand) able to measure automatically the Brinell hardness value or "calibrated shear pin" on indents from 0,5 mm to 2,5 mm or from 1,5 mm to 5 mm of diameter (made in two versions). Equipped with a stainless steel body and a magnetic base, it can stay in an erect and stable position above the indent allowing an image vision perfectly clean and ensuring careful and constant measurements. 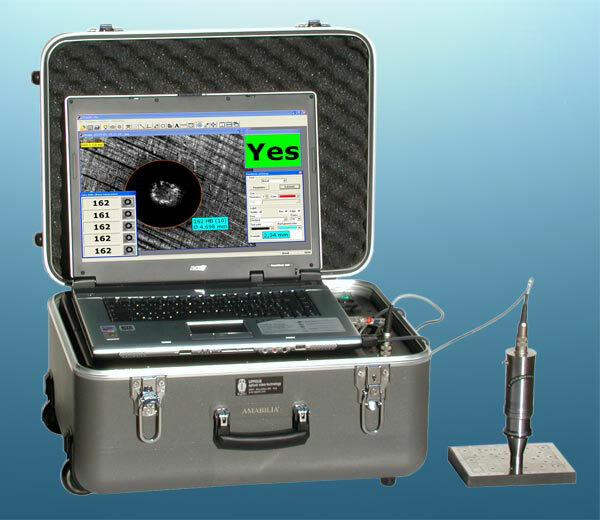 Placing the Brinell Check on a flat or curved surface and pressing the acquisition button, the image of the indent, with the relative hardness and diameter values with thousandth of micron, are sent to the PC or to the laptop. 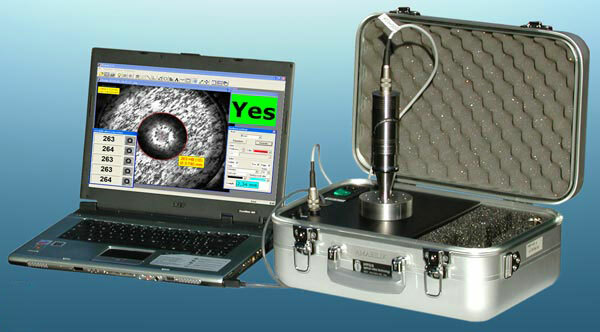 Through the setting of a tolerance value on the measurements to be made, the user will have the possibility to evaluate visually the accuracy of the indent, thanks to a "YES/NO" response which will appear in an unequivocal way on the monitor. Moreover it's possible to make appearing on the screen, in an automatic succession, the values of the last five hardness measurements made. With Brinell Check is possible to work up to 10 meters far from the work position thanks to the availability of Video Power cables and thanks to the software possibility of enlarging on the monitor, the label of values and the centre of pointing. 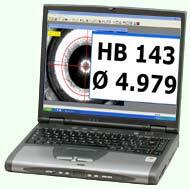 The images with their content can be saved automatically in a predefined folder, while in a compatible file with Excel are archived all the information relative to: identification of the user (number or name), date/hour, parameters on the hardness test, measured hardness values and path of the saved image. The adopted technical-video solutions, the characteristics of the software and the excellent "quality-price" relation, make the Brinell Check one of the most performing tool still present in the sector. Since often in the empiric working, for matters of time (but also of costs), materials not enough smooth and not standardized are used, some problems in the measurements. 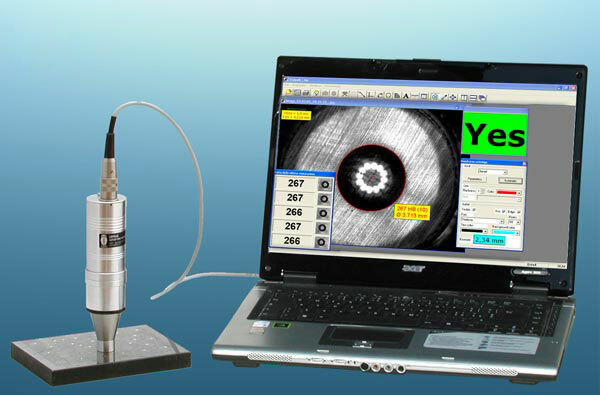 This method allows to have very reliable measurements, but you must wait for a few seconds more to visualize the indent with relate diameter and Hardness Brinell value. If measurements are made on different types of material, you need to save all parameters to use them in the future on the same type of material. The Brinell profiles are designed specifically for this purpose, because when you find the ideal parameters to make your measurements, you can save and recall them whenever you need. The PC / Laptop is not included. 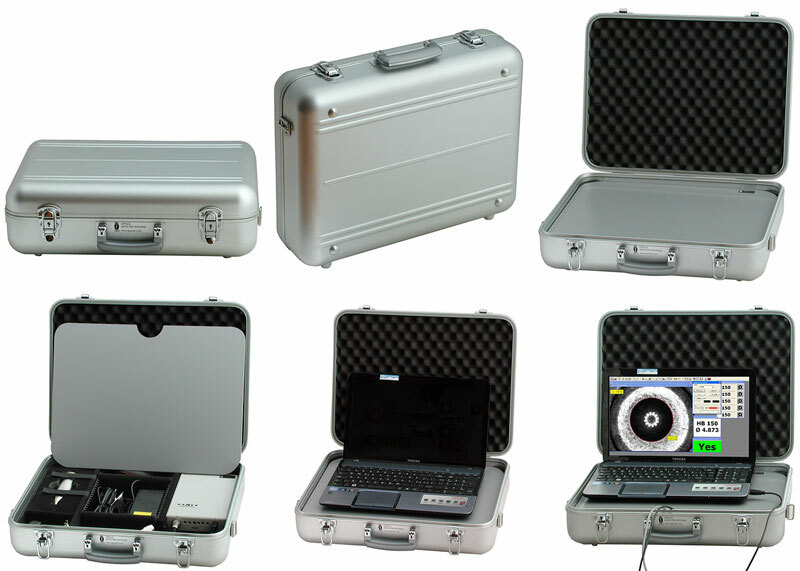 Brinell Check is provided with a little and hard case in printed aluminium, Power Carrying Case, with all the accessories and electric parts already installed (battery, battery-charger, USB interface, etc.) ready to be connected to a PC or laptop USB port (USB2.0) through its cable. The working autonomy of the Brinell Check is guaranteed for eight consecutive hours, while the reload last about two hours directly connecting to a socket with a voltage of 100/240V 50/60Hz. Thanks to the potentialities of the software in outfit, linking with a special cable to the Power Carrying Case, it is also possible to use other video systems already existing in the agency to make various types of measurements, comparisons, fillings, etc. Power Carrying Case BR: Small and strong case in printed aluminium full of all the accessories and electric parts already wired (battery, battery-charger, etc...) ready to be connected to the USB ports (USB2.0) of a PC or a portable one through its USB cables. 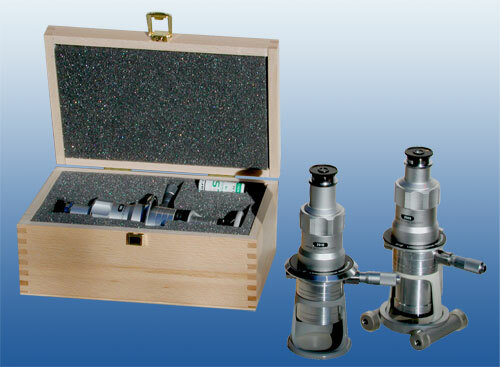 A practical and robust carrying case "in printed aluminium" able to contain and feed autonomously the complete set which composes the Brinell Check is now available. Very compact, the Carrying Case Station BR is arranged to be operating in less than two minutes. The space inside the carrying case has been optimized to contain, besides the set Brinell Check (battery, battery-charger, and so on) also a laptop and various documentations. The big autonomy of the battery guarantees the Brinell Check about five hours of consecutive work, while the reload can be made also during the use. A series of LEDs alert the operator of the remaining autonomy while the battery recharges in 8 hours. Maximum laptop dimensions: until 17"
The Brinell Check Power Kit is very similar to the two previous versions, but it doesn't include the Carrying Case system, because it is supplied with separated parts. BR case: case for Brinell Check made in printed aluminium. 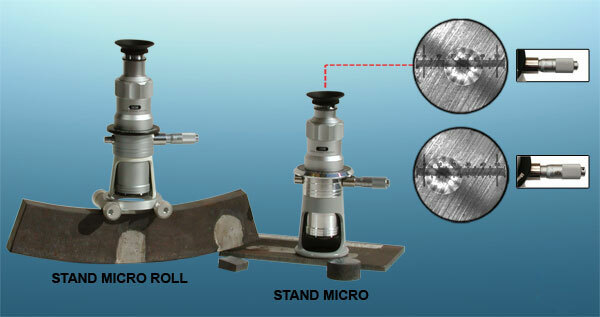 The Stand Micro is a pocket microscope 20X/40X very strong, completely in aluminium, practical and manageable. It can be used as tool of universal measure for the control of surfaces, to measure the diameter of small holes, meshes of textiles, etc., but thanks to its particular technical characteristics it has been immediately appreciated as ideal optical instruments of Brinell indentations. Its led annular lighting (6000°K) incorporated high luminous intensity allows easy measurements of cracks in the materials on plain and curved surfaces (this last if provided of special base). The precise focusing by means of knurled metal ring coaxial with optical axe allows the control and measuring in movements on “Z” axe up to 7 mm through a nonius with decimal divisions. The ocular is provided of a measuring reticle of 6mm with divisions of 0,05mm and it is possible to regulate it in the focusing suiting it for your sight. The alignment of the division notches with the object to be measured comes rotating the block of the ocular avoiding in this way the moving of the tool or the object under examination. The great practicality in the use of this device is due in particular way to the possibility of transversal micrometrical movement of the optical head on the object to be measured through a screw cursor. The maximum excursion of the cursor is 8mm and is controllable on its nonius with centesimal divisions; with this system is possible an express and precise alignment of a scale division of the ocular with a point of the object to measure. Similar to the Stand Micro, this new optical measuring device differs from the first one because it has the possibility to be place also on curved surfaces till the minimal beam of 40mm thanks to its detail support base. 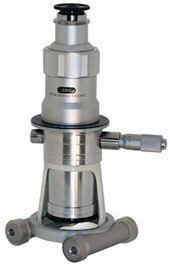 In order to allow a comfortable and immediate frame of the surface to examine or to measure (cylinders the much long or of large dimensions) the base is revolving. 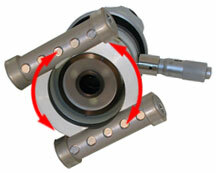 On request at the order STAND MICRO ROLL can be supplied of magnetic base.